Mobile phones are almost as ubiquitous as other personal accessories such as a wrist watch or a wallet. Many people go everywhere with their cellphone so that a mobile telephone number is typically the one sure way that a person can be reached. Therefore, it is important to want to keep that number when changing operators. 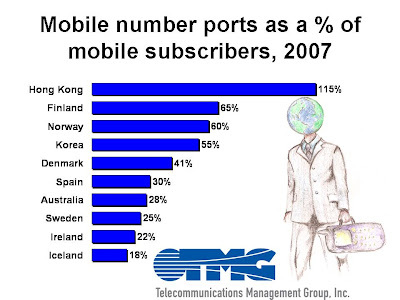 Mobile number portability (MNP) is the subject of a new TMG, Inc. report, Mobile Number Portability Around the World. MNP started a little over a decade ago. Somewhat surprisingly, less than 50 countries in the world today allow mobile users to keep their mobile number when changing providers. Most of these countries are in developed countries and the two largest mobile markets, China and India, do not currently provide for mobile number portability. This has kept the number of people who have ported their mobile number relatively low at some 150 million. The main argument against MNP has been the cost of implementation. Hong Kong leads the world in the proportion of users who have kept their mobile number when changing providers. Statistically, every mobile subscriber in Hong Kong has changed provider once while keeping their mobile number. Mobile Number Portability Around the World is an unparalled source of statistics on MNP with data showing the number of ports for each country and for each year that MNP has been in existence.